Our Learner of the Month for October is Irslan Ahmed (also known as Sunny), an HR Systems and Data Analyst at Cardtronics based in Hatfield, who has been completing a Level 4 Data Analyst apprenticeship with Estio since September 2018. Cardtronics makes ATM cash access convenient where people shop, work, and live. Cardtronics provides services to approximately 230,000 ATMs in North America, Europe, Asia-Pacific, and Africa. Currently Cardtronics have 16 apprentices on program. “I chose to start this apprenticeship to better myself, and get my data analytics skills to an advanced stage. “I have a big interest in systems and data analytics. I feel data analytics is important for any business to the extent that making a good decisions is. The practice of analytics is all about supporting decision making by providing the relevant facts that will allow any business to make a better decision. I believe with data analysis, the business can also find information for which it didn’t even know it needed and can pinpoint any issues a business is facing. “Since starting my apprenticeship I have learnt a lot in terms of the different types of data. We have recently started to learn Power BI; which has been exciting and offers a more advanced solution to Excel. I am anticipated to learn R and Python languages and I feel this would further enhance my technical skills. “I’ve found the Power BI module to be challenging in the sense that there is a lot to learn and get used to as it’s a new system. However, it’s also very exciting! I’ve really enjoyed this as you are actually using a system and learning the power of your data and how you can manipulate it to get the reports you desire. “My line manager, trainer and skills development coaches have been great. I have learnt a lot from my Trainer, Giovanna, and like that I have been challenged to think and express my knowledge. I also like that in training I have remote sessions in which a lot of the groups are interactive and add great value to the sessions. I always go back and revisit the recorded sessions too; so that is a great help. “Apprenticeships are a great way to upskill our current employees by allowing the company to invest in training for them. It’s also a fantastic way of introducing new people into Cardtronics who will bring fresh new ideas into the mix. 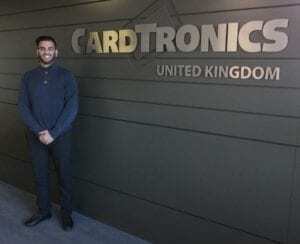 “It’s also brilliant having a structured training programme for any prospective candidates who are eager to join Cardtronics and earn a recognised qualification at the same time. We are so thrilled that Sunny has been enjoying his apprenticeship and has been so successful so far. We feature the Learner and their business in our monthly blog, and each Learner wins a £25 Amazon voucher.